Have you tried the Staalmeester brushes yet? We’ve being playing around with them here in my shop and we are loving them! 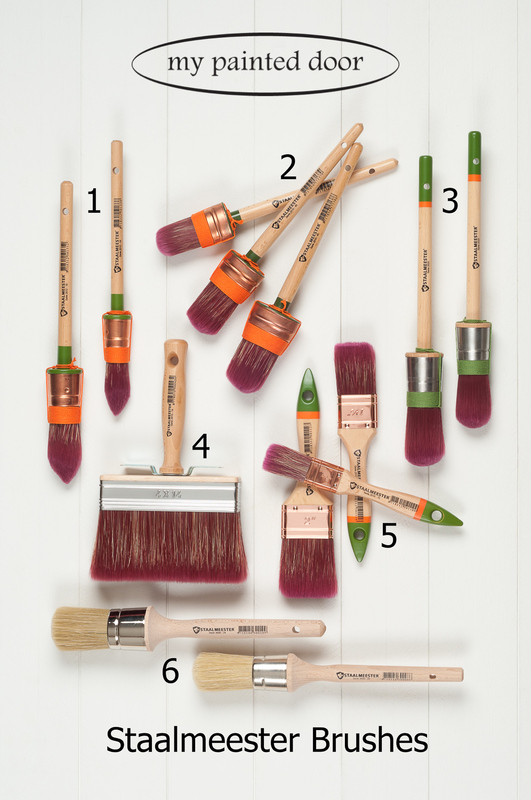 These brushes are perfect for using with Fusion Mineral Paint. Here’s the deal. I had to stand on a ladder to get high enough to take this photo. 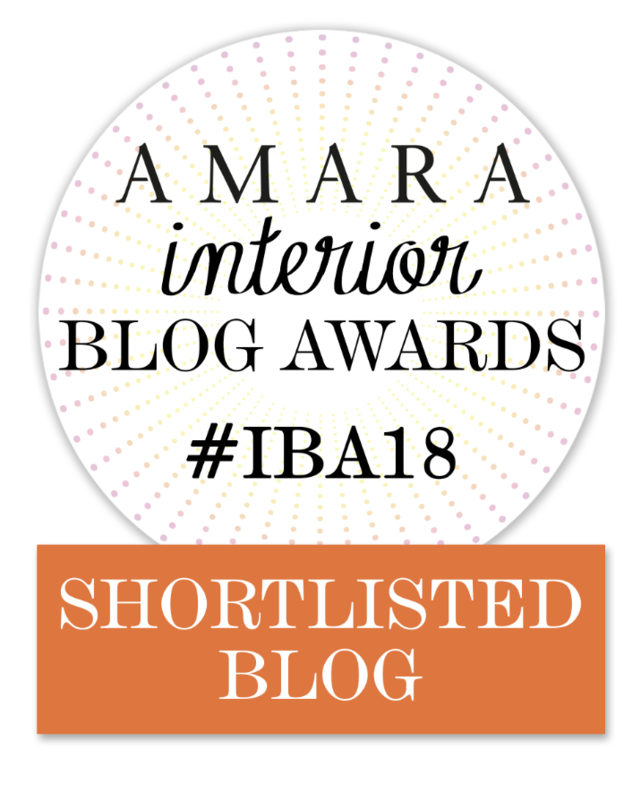 Therefore, it would mean the world to me if you took the time to pin this photo for future reference so that I know that my efforts were worthwhile. (Just kidding. Sorta). I’ve written a brief description of each of the Staalmeester brushes and at the end of my blog post I’ve included some tips for using these brushes. There is also a link to some great videos about Staalmeester brushes. Bristles are a synthetic and natural blend. This pointed paint brush is ideal for painting detailed furniture edges, mouldings, banisters, window frames, ledges, doors, spindles and furniture. The pointed head makes it perfect for edging work and cutting in and generally producing a great finish. 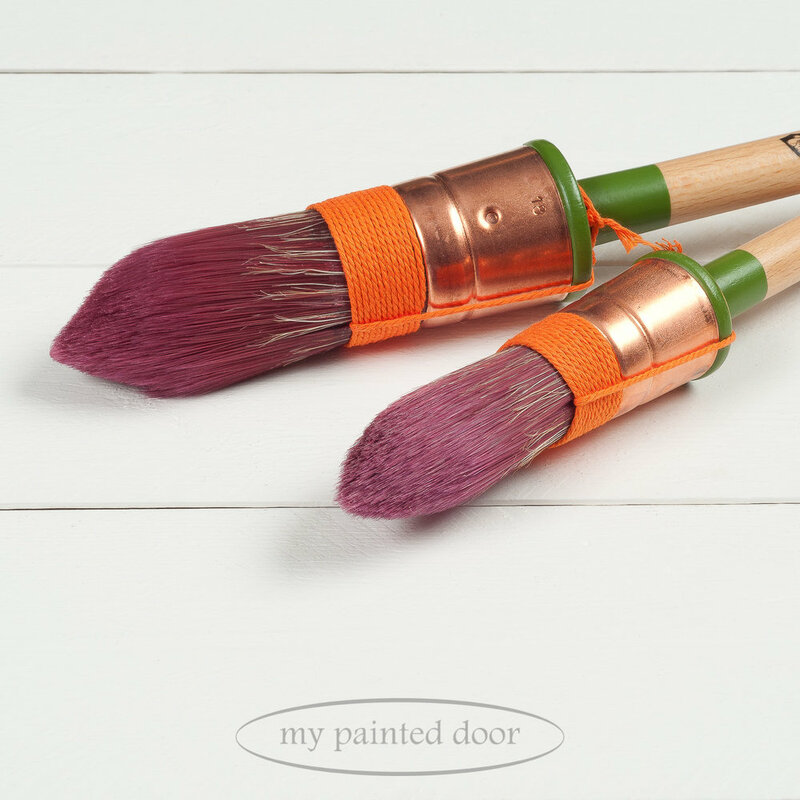 We love these brushes for painting chairs and spindles! The oval shape of this brush makes it easy to switch between narrow and larger surfaces with the same brush. It can be used on small surfaces such as spindles or window frames and also on larger areas such as doors, vanities, cabinets and doors. The synthetic fiber resists water based paint and are soft and supple which results in a smooth finish. These brushes are super soft and are my personal favourite to use with Fusion Mineral Paint! This 4” brush is ideal for large flat surfaces. It’s also great for walls! To create an instant European look, mix a bit of Fusion Fresco into your favourite colour of Fusion Mineral Paint and do a feature wall in a cross-hatch technique. This brush is also great for painting ceilings and walls with latex or acrylic paints. It fills up pores better than a paint roller. We all have preferences … and many people are used to working with a flat paintbrush! This brush is best used to varnish or stain medium to large areas such as desks, dressers, or doors. High-quality 100% pure China bristle. 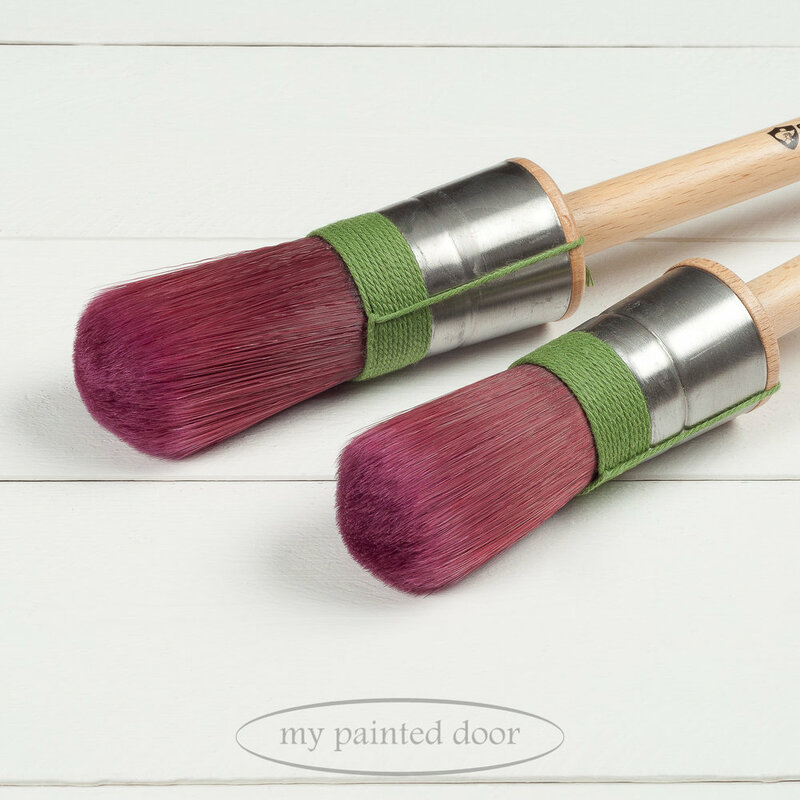 This brush is perfect for applying Fusion Mineral Paint beeswax finishes! It can also be used for applying Homestead House Stain and Finishing Oil. 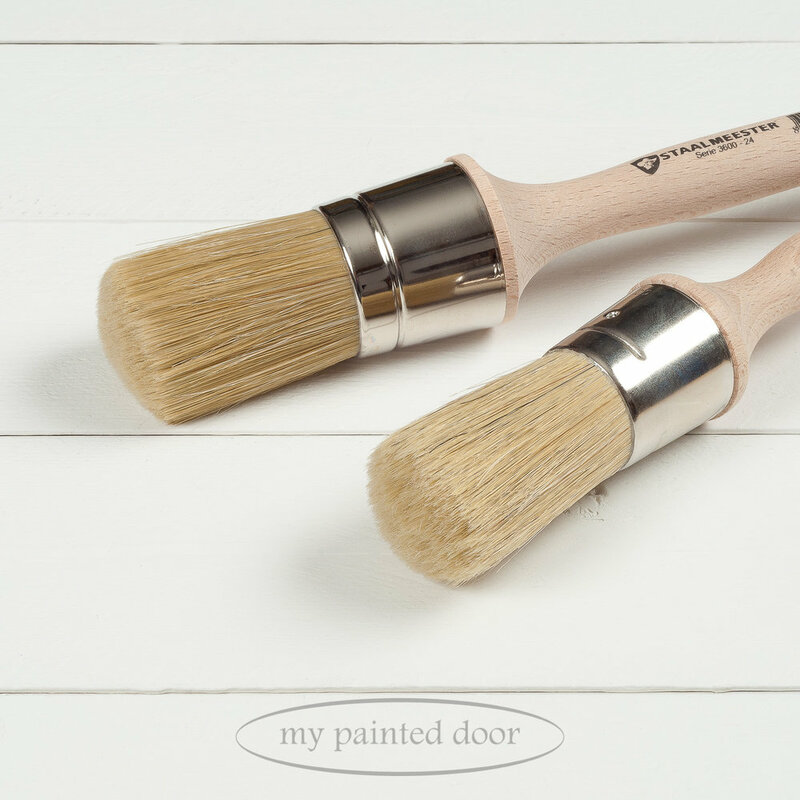 This brush is also wonderful to use with milk paint! It can also be used with Fusion Mineral Paint brush but it tends to show brush strokes more than the synthetic/natural blend brushes or the synthetic brushes. So, if you are looking for a handpainted look, this brush is perfect! Important: If you use wax or oil stains with this brush, it needs to be cleaned with odourless solvents (mineral spirits). These products cannot be cleaned with just soap and water. Your brushes can be used for many years if cared for properly! Some of the Staalmeester brushes have a band of string on them. Do not remove the string as it gives the bristles direction and perfect tension. Remove your brush from the package and take a couple seconds to brush the bristles back and forth against your hand to loosen the bristles and dislodge any that are loose. When starting off with a new or dry brush, submerge the brush into water up to the ferrule to slightly dampen the bristles. Give the bristles and the string a squeeze so that the brush is only damp, but not dripping with water. When dipping your brush into the paint, there is no need to go the full length of the bristle. At most, only 3/4 of your brush should have paint on it. We don’t recommend getting paint up to the edge of the string. Your paint brush will last longer and be much easier to clean if you don’t get paint up to the string. Don’t allow your brush to sit idle as paint will dry quickly onto the bristles and is much harder to clean at that point. If you get interrupted during your painting, cover your brush with a damp paper towel so paint cannot dry on the bristles. After you finish painting, submerge your brush into water. Allow to sit 30 minutes or longer to dislodge paint from bristles. After soaking for a bit, rinse your brush free of any paint. Using the hole in the handle, allow paint brush to hang when drying. 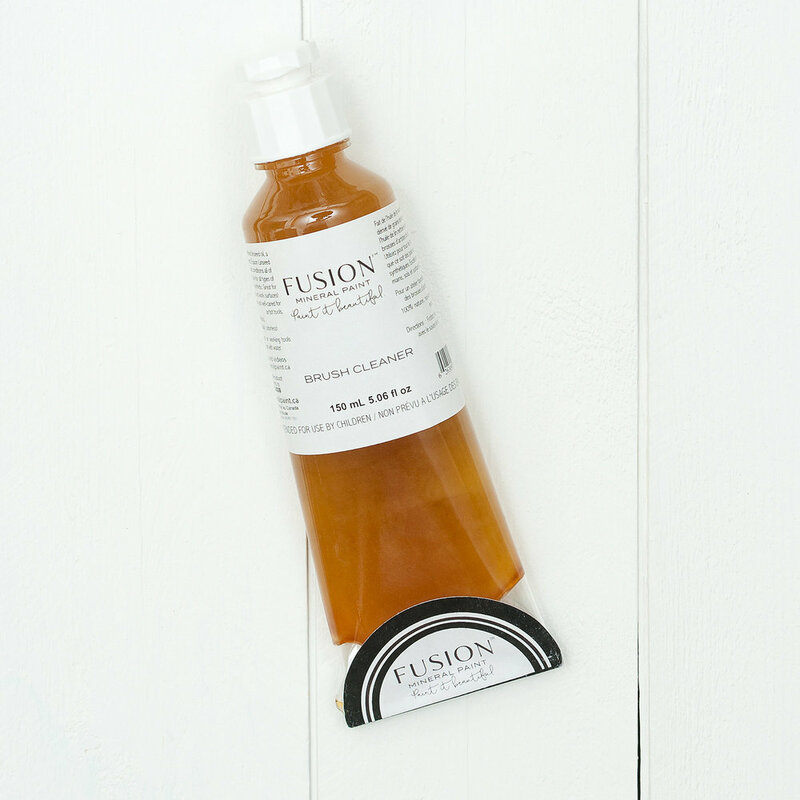 Using Fusion Brush Cleaner is a great way to condition the bristles. If paint is allowed to dry on the bristles, it will become stiff as the paint acts like a glue. It is crucial that all paint is removed from your brush before you allow it to dry. You can watch more videos about Staalmeester Brushes and Fusion Mineral Paint on my video page! Posted on December 1, 2018 by Sue Sikorski and filed under Fusion Mineral Paint and tagged 2018 paint brush staalmeester brush brush cleaner.